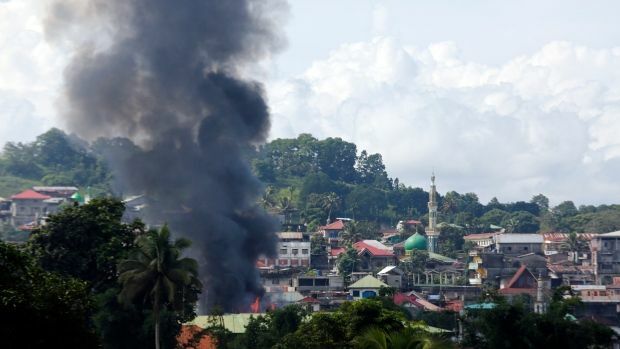 Eleven government soldiers were killed in a “friendly fire” airstrike as the battle to free Marawi City from terrorist fighters continues to rage. The calamity brings to 171 the number of confirmed deaths since the Maute terror group began its rampage through the city under the black flag of the Islamic State (IS). Shortly after the chaos erupted nine days ago, President Duterte imposed martial law throughout the island of Mindanao, to quell what he said was an IS bid to establish a new power base in the Philippines. He has not ruled out extending the decree across the whole of the country. Despite recent claims that the government was in “full control” of the city fierce fighting continues to rage with eight foreign fighters identified among the dead jihadis. Defence Secretary Delfin Lorenzana said: “It’s very painful. It’s very sad to be hitting our own troops. It’s sad but sometimes it happens in the fog of war. He also said that many terrorists may have escaped, despite numerous checkpoints and other security measures. “We have reports they are going to some of the towns around Marawi city,” Mr Lorenzana added. He also said there were believed to be about 500 militants at the start of the clashes, with no more than 100 now remaining. With only 120 confirmed dead, it is feared the others may have left the city. Among the dead were jihadis from Saudi Arabia, Chechnya, Yemen, Malaysia and Indonesia. The terrorists are also holding more than 200 hostages, including a local priest who was filmed relaying his captors’ demand for troops to withdraw. The International Committee of the Red Cross has called for a humanitarian ceasefire. However, President Duterte has vowed to continue offensives until order is restored. “If it’s war, my orders are really are to wipe them out, everyone. When I say wipe them out better if you shoot him in the head, shoot him again in the heart,” he said in a speech in Manila. He also said that he believed the chaos was too widespread and well coordinated to solely be the work of local militants. “You know, the rebellion in Mindanao, it’s not Maute, it’s purely ISIS,” he said. So far, it is known that the terrorists have murdered 19 civilians and 32 soldiers and police officers have been killed in clashes. The chaos erupted when security forces raided a house to arrest Isnilon Hapilon, IS’s representative, or ‘emir’ in the region. Hapilon, who is also a leader of Abu Sayyaf, has a $5 million FBI bounty on his head. It is believed he was being harboured by the locally-based Maute terror group and working to unite the various Islamist factions of the country under the black flag of IS. The strength of the response to the failed raid suggests that he may have made some headway to this end. He remains at large. A video posted on the website of Islamic State’s Amaq news agency shows fighters alongside bodies of dead soldiers inside a vehicle. The authenticity of the video and the images on social media could not be independently verified. Military spokesman Restituto Padilla said an investigation would be held to establish how the air force plane killed ground troops. “The risk involved in being a soldier, being an airman, being a sailor, being a marine is very much in the heart of every soldier,” he said.